Coach: Bob Huggins (22-17 NCAA tournament record). F/G Da’Sean Butler, 6-7/230, Sr.
F Devin Ebanks, 6-9/215, Soph. F Kevin Jones, 6-8/250, Soph. F Wellington Smith, 6-7/245, Sr.
G Darryl Bryant, 6-2/200, Soph. F John Flowers, 6-7/215, Jr.
F Deniz Kilicli, 6-9/260, Fr. 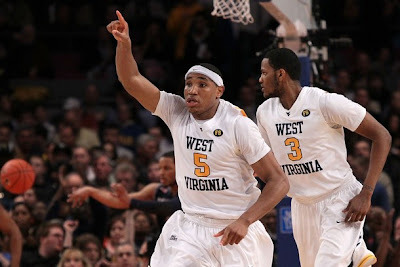 F Cam Thoroughman, 6-7/240, Jr.
G Joe Mazzulla, 6-2/200, Jr.
G Casey Mitchell, 6-4/225, Jr.
West Virginia Profile: West Virginia comes into March Madness 2010 as a hot team having won the Big East Tournament and having a great run down the stretch in the Big East. This team is led by Mr. Clutch senior Da'Sean Butler who hit 6 game winners this season, the reason the Mountaineers need all of those game winning shots is due to turnovers and poor foul shooting. This is a tough team mentally and physically on the glass that has already won a tough Big East Tournament and we expect them to advance to the March Madness 2010 Final Four.